KNLT welcomes and depends upon the support of individuals, foundations, corporations, and government agencies to secure the protection of Kentucky's wildlands. Donations qualify as a charitable contribution in accordance with IRS regulations and will help to protect and preserve Kentucky's forests and migratory corridors for generations to come. Get involved today! "On the positive side…lands are being purchased by private groups such as the Kentucky Natural Lands Trust, and there are signs of hope on the horizon… In the end, it depends on all of us to support conservation activities to ensure a healthy environment for generations of future Kentuckians." One Square Mile Donor: Consider making a donation to protect an entire square mile of wildlands. The One Square Mile Award honors those who have made donations that meet the financial level needed to purchase a minimum of 640 acres. Contact us to learn more. 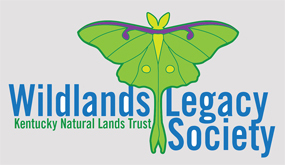 Wildlands Legacy Society: Including a gift to KNLT in your estate plans ensures that we can continue our work for generations to come. Members receive a luna moth lapel pin and will be invited to special events throughout the year. There are many ways to meet your financial and philanthropic goals. Download our brochure to learn more: Wildlands Legacy Society brochure (PDF). Matching Gift: Double your giving through a match from your employer. Check with you Human Resources Manager to learn more. Stock or Mutual Fund Donation: Direct transfers of stock or mutual funds can be made from your broker to KNLT by contacting Caroline Meena at Stock Yards Bank & Trust at 1-800-625-9066. Give from your IRA: IRA Charitable Rollover, now permanent as of Dec 2015, allows individuals who have reached age 70 1/2 to donate up to $100,000 to charitable organizations directly from their Individual Retirement Account (IRA), without treating the distribution as taxable income. An essential detail is that your plan administrator must issue the check directly to the charity. Consult your plan administrator or tax advisor for more information about this means of giving and specific tax advice. Shop to Support: Support KNLT by using AmazonSmile and Kroger Community Rewards (org #VQ829). Join our social media networks and tell your friends and family about our work. Get news & upcoming event information.